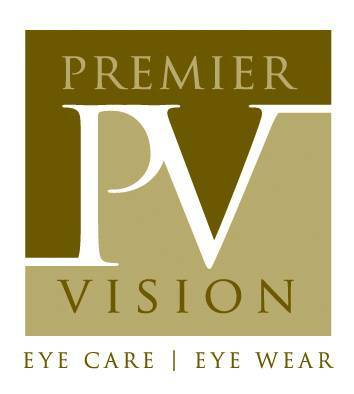 At Premier Vision, Dr. De La Peña and Dr. Garza take the time to explain the results of your eye exam, describe your options and listen to your eye care needs. Because maintaining good eye health is an ongoing partnership, we encourage you to ask questions and share your health information, which could be vital to monitoring, diagnosing and treating potential vision problems. The founder of PREMIER VISION, Dr. De La Peña was born in California but grew up in Texas at an early age. She was awarded the Academic Excellence Award Scholarship from the University of Houston where she completed eight years of intense studies. She received her Doctor of Optometry degree from the renowned University of Houston College of Optometry in 2002. Fluent in Spanish, Dr. De La Peña is a Diplomate of the American Board of Optometry, Texas licensed as a therapeutic optometrist and optometric glaucoma specialist who can diagnose and treat eye diseases. Dr. De La Peña co-manages refractive eye surgeries with some of the top Lasik surgeons in the U.S. In addition, she has experience in fitting a broad scope of contact lenses such as, spherical, toric, monovision, bifocal, and rigid gas permeable lenses. While a student in college, she also worked as an optician for five years in order to gain first hand experience in properly fitting, dispensing, and fabricating glasses. She understands the significance of making glasses properly in order to see comfortably and clearly. A mother of three energetic sons, Dr. De La Peña realizes the importance of family. She personally designed a child-friendly area in the office in order to welcome the entire family. In addition, she is proud to be a participating optometrist of the InfantSee Program which advocates comprehensive eye exams at no cost for all infants up to twelve months. 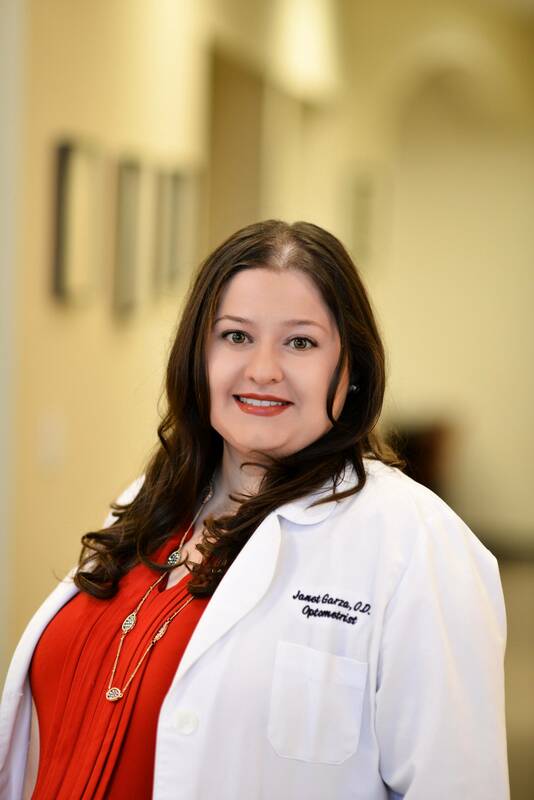 Dr. De La Peña is an active member of the American Optometric Association, Texas Optometric Association, Harris County Optometric Society, and University of Houston Alumni. She is also involved with the Northwest Chamber of Commerce and Prince of Peace Catholic Church. She enjoys playing the violin and practicing soccer with her husband and three sons. Dr. Garza was born in Tomball, TX and is a native to the Northwest Houston area. She attended The University of Texas at Austin for her undergraduate studies followed by The University of Houston College of Optometry where she obtained her Doctor of Optometry degree. With the intention of being a well-rounded optometrist, Dr. Garza went on to complete a residency in Primary Care optometry with a subspecialty in ocular disease. 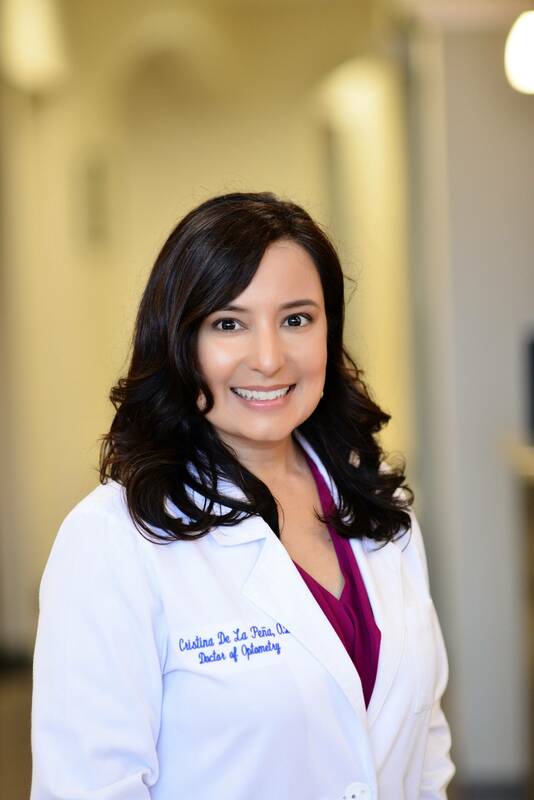 Throughout the course of her training, Dr. Garza has worked with numerous specialists and expanded her knowledge base to best treat her patients. She is certified by the American Board of Optometry and is Texas licensed as a therapeutic optometrist and optometric glaucoma specialist. Dr. Garza is also fluent in Spanish. In addition to routine eye care, she is experienced in the areas of dry eye treatment, refractive and cataract surgery co-management, and specialty contact lens fittings. In addition, she is certified to fit Ortho-K lenses for the growing patient interest in slowing myopia progression. Dr. Garza is currently also adjunct faculty at The University of Houston College of Optometry. She is part of the American Optometric Association, Texas Optometric Association, and Harris County Optometric Society. In her spare time, she enjoys relaxing nights at the movies and spending quality time with her friends and family.